New road signs designed to send a message are also sparking controversy in Manchester, New Hampshire. 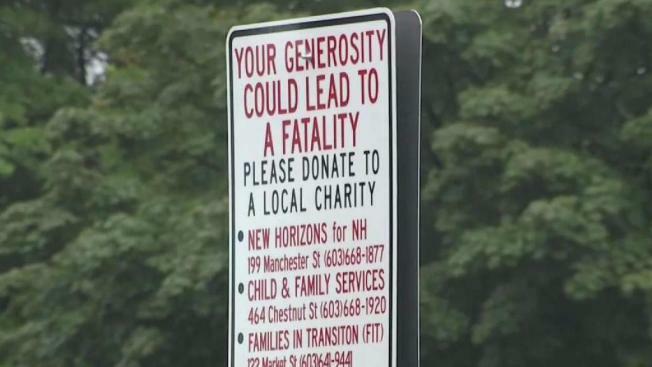 The signs read, “Your generosity could lead to a fatality. Please donate to a local charity.” It is an initiative to wipe out pan handling while also curbing substance abuse. “I’m just trying to get by and live”, said Joe Pinto, who is homeless and relies on panhandling to get by. Pinto said he is tired of the stigma panhandlers have. “I just try to get food. You get a lot of people who do heroin, who do drugs, smoke crack. That's not me,” he said. Chief Nick Willard of the Manchester, New Hampshire Police Department said directly giving money to panhandlers is enabling those who are addicted to drugs. “Your 5 dollars could go to a fatal overdose of a human being. We've had 25 panhandlers overdose, 6 of whom have died,” Willard explained. Fifteen new signs have gone up with a message to give to local charities that help the homeless. These charities help provide food and shelter. Pinto said he is skeptical the signs will help. He thinks the money panhandlers make prevents them from committing crimes. “What are you supposed to do, rob a bank? A liquor store? That’s what people are forced to do. I'm not going to do it but you know what I mean. It makes it harder for us,” Pinto said.